A journey through the interesting landscape of Morovia will take you to Prague, the economic and cultural center of Bohemia, located on the banks of the Moldavia. There is a possibility for a lunch in a typical Bohemian restaurant. In the afternoon we will take you on a city tour of Prague, often referred to as the Golden City. 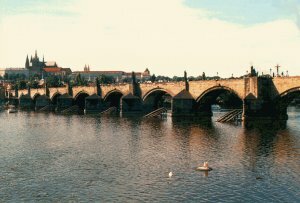 You will see the King´s Castle, the famous Charles bridge, the National Theater, the Jewish Cemetery, the Parisian street, the old town square and Wencels square. There will be some time to individually explore the old quarters of Prague as well as for shopping.